The Sidewalk Carabid is a ground beetle. It is very common in residential areas of North America where it lives mostly in larger towns and cities. The adults live for a long time and they can be seen frequently during the summer. The Sidewalk Carabid often hides under rocks and stones, but at times it is wanders around. These bugs like to take paths that are easy to walk on, so they often wander right down a sidewalk. Sidewalk Carabids are beneficial bugs that were originally brought to the United States from Europe. They feed on any kind of larvae that live on the ground, and they eat large quantities of insect eggs. These beetles live in grass and other ground covers, and they love to live in compost piles. 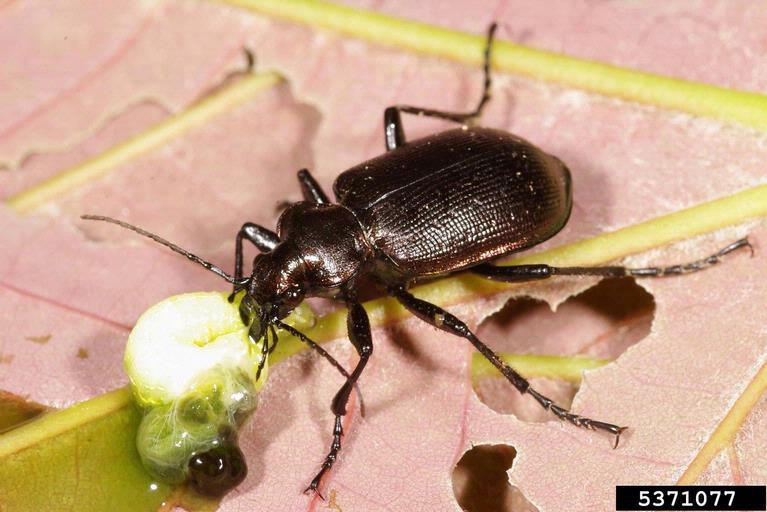 In the garden they prefer to eat cut worms, so gardeners love to see these beetles move it. Cutworms are very destructive in a garden because during the night, cut worms eat the stems of small plants until they cut the plant down, killing it. When a garden has Sidewalk Carabids living near by, there are fewer cutworms to kill young plants. Sidewalk Carabids range in size from about 2 mm to 25 mm (1/8 inch to 1 inch). 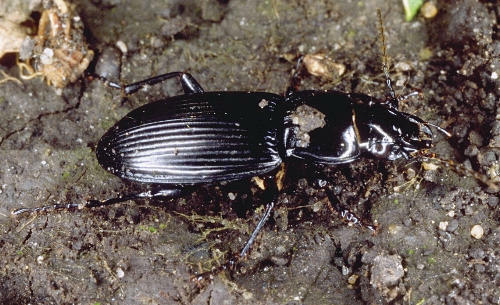 The Sidewalk Carabid is all shiny black with large powerful jaws. Like most ground beetles, sidewalk carabids move fairly quickly and it is not uncommon for them to get into homes, either by sneaking in a door or finding a crack in the foundation. People are often concerned when these beetles get into the house. Remember that these are predatory beetles that eat insect eggs and as a result are the good bugs. Most houses probably do not have enough insect eggs to keep a sidewalk carabid alive, and it is usually best just to carefully take the beetle outside.